As Americans are increasingly using mobile technology to access online information on the go, they are turning to mobile devices to help them get from one place to another. Despite the growing popularity of ride-hailing applications such as Uber and Lyft, the biggest transportation use of smartphones by far has to do with driving rather than sharing a ride. Fully 67% of smartphone owners use their phone at least occasionally to get turn-by-turn navigation while driving, with 31% doing so frequently, according to a recent Pew Research Center report on how Americans use their phones. Indeed, 43% of smartphone owners say turn-by-turn navigation is the only transit-related function they use on their phone at least occasionally, according to new analysis of the data. Some 16% say they never use their mobile device for this purpose. Turn-by-turn navigation is a popular feature among a wide range of smartphone owners, but younger adults are especially avid users. Some 80% of 18- to 29-year-old smartphone owners use their phone for real-time directions while at the wheel at least occasionally, and just 7% indicate that they never do so. Older adults are substantially less likely to use their phone for this purpose, but even so, more than one-third of smartphone owners ages 65 and older do so at least occasionally. College-educated and more-affluent smartphone owners are also especially likely to use their phones for navigation while driving. These groups are also more likely to own a smartphone. 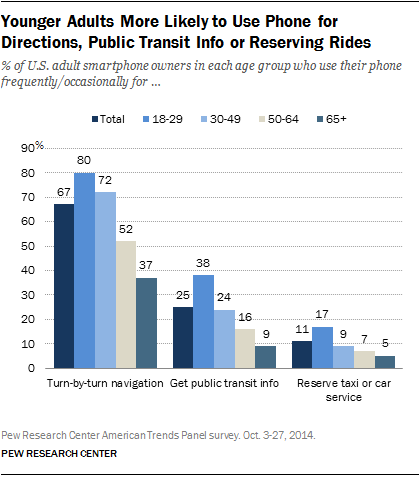 Additionally, 25% of smartphone owners (and 38% of those ages 18-29) use their phone at least occasionally to find public transit information. Several groups stand out when it comes to using their phones for public transit information. Minority and immigrant workers tend to rely more heavily on public transportation for commuting to their jobs than other groups do, according to 2009 U.S. Census Bureau data, and these groups are also relatively likely to navigate public transit using a mobile device. Some 37% of African-American and 30% of Hispanic smartphone owners use their phone to get public transit information at least occasionally, compared with 21% of whites. Foreign-born smartphone owners are also more likely to access public transportation on the go than those born in the U.S. (34% vs. 24%). In addition, 41% of smartphone owners from the Northeast (home to several of the most traveled transit systems in the country) use their phone at least occasionally to look up public transit information, a substantially higher share than in other regions of the country. This activity is also more popular among smartphone owners who live in an urban area than among those who live in the suburbs or a rural area. Compared with public transit and real-time navigation, the use of smartphones to hail a taxi or car service is a relatively niche behavior. Some 11% of smartphone owners use their phone for this purpose at least on occasion, but 72% of smartphone owners have never done so. This activity is particularly common among young adults, those who have attended college and those with relatively high household incomes. Despite the slightly different demographic characteristics of mobile public transit users and mobile car-hailers, there is a substantial amount of overlap between these two groups, our new analysis shows. 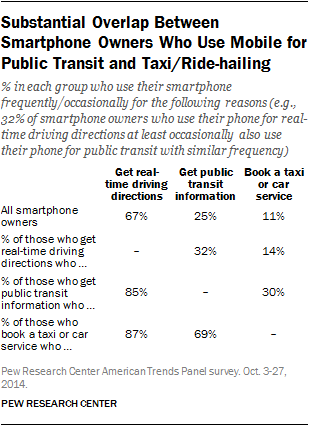 Fully 69% of those who use their phone to book a taxi or car service at least occasionally say that they also use their phone regularly for public transit information. Similarly, 30% of mobile public transit users indicate that they use their phone for ride-hailing at least on occasion. And regardless of which mode (or modes) of transportation they navigate using their smartphone, those who use their phone to help them get from place to place are more likely to say that they couldn’t imagine living without it. This difference is especially pronounced for those who use their phones while driving: 52% of those who use their phone at least occasionally for turn-by-turn driving directions describe their phone as “something they can’t live without,” compared with just 34% of those who rarely or never use their phone to navigate on the road. Perhaps that shouldn’t be surprising, considering that getting directions or finding a way to get somewhere is the top problem smartphone owners say they encounter when they find themselves without their phone.